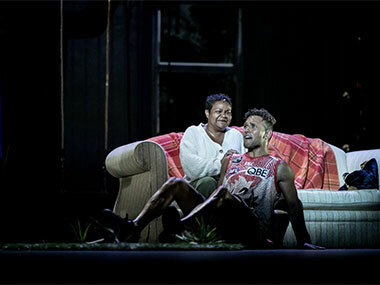 It takes much courage and collaboration to put the sorry saga of youth suicide amongst Australia's Aborigines on the stage. Josh Bond started this process after personal experience; the physical theatre company Legs on the Wall took up the baton – a company I first hailed many years ago in the show 'All of Me' when they first realised that they could apply their physical brilliance to storytelling even better than just showing off; and then actress Ursula Yovich – already acting in the production – was asked to follow up on her success with 'Barbara and the Camp Dogs' to give the script better form, again from her personal experience. For it's all too common for Aboriginal people to have friends or relatives take their own lives. Amazingly, these self-killers can be as young as 10! At the very beginning of the show in the SOH Drama Theatre, we're told that 5 young Aboriginal girls have done just that already this year. What's not emphasised, is that, while NSW Aborigines have a suicide rate comparable with their white neighbours, it's in the more remote parts of Australia that a habit of suicide has become the number one answer to dysfunctional family and societal situations. “Down in Perth, 1000km to the south (of The Kimberley), West Australian coroner Ros Fogliani is putting the finishing touches to her report on an inquest that required hundreds of conversations, often inside the Coroner’s Court but also in tiny Aboriginal outposts, about the suicides of 13 young Aboriginal people in The Kimberley within a 3½- year period up to March 2016. Five of the deaths were children aged between 10 and 13; two of those were sisters. Even before coroner Fogliani’s findings have even been released (possibly later this month), and over a period of less than a fortnight, there has been another cluster of suicides by three young Aboriginal girls in Western Australia, one of them — a 14-year-old — in The Kimberley. Another two girls committed suicide in Queensland and South Australia”. So, the circumstances in which a hopeful young Aboriginal AFL player, Bear would be so upset by being called a monkey by a small-town team-mate – recalling the Adam Goodes controversy at the Swans in Sydney – to believe in suicide as the only way out, seem somewhat atypical. Yes, we do discover that his father has also hanged himself from the same tree in their garden when Bear and his twin sister Ev were just 6 (no reason offered). And the excellent AV by Sam James does remind us of the First Fleet's arrival loaded with soldiers (and settlers who were soon stealing all the most fertile land for their own survival). But the strength of family relations and friendship with his sister's beau, Ash, should have seen him through. As Ash declares to Bear's spirit at the end: “Sorry mate, I've gotta let go”; backed up by Mum Rose offering her philosophy following both husband and son's deaths: “But I want to live”. However, are these just icing on the surface for a soul who may well have witnessed his father's terminally swollen face as he swung from that gum – before taking his sister off to hide in the laundry cupboard in terror? And maybe another problem lay in Bear's assertion that “Footy's not just a game; it's everything”? Certainly, footy gives the whole cast some wonderfully choreographed fun. 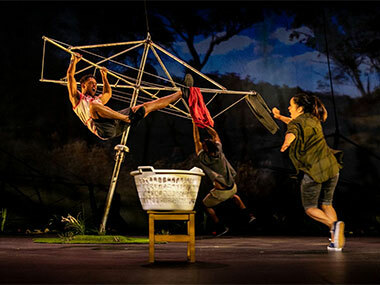 And the physicality dreamt up by co-directors Josh Bond and Gavin Robins extends to a flying, malevolent Hills Hoist clung to by Tibian Wyles's Ash, the twins entwined in mid-air as Yovich's Mum Rose recalls her pregnancy and birth, memories of Dad giving a bath to the twins, and Caleena Sansbury's furious attempts as Evelyn to chop down the tree that's taken her father and brother (Kyle Shilling). Once again, as with 'The Weekend', that's a whole raft of new, talented Aboriginal names for a project, which as Yovich has pointed out, is under Indigenous control from go to wo(e). Somehow, Aloysius Peters, aka The Great Peters is woven into this saga by Ash. For, back in the great days of the travelling sideshow, he jumped off 75 foot high bridges with a rope around his neck and had developed muscles that could resist strangulation at the bottom of the drop. Until one day, he didn't! 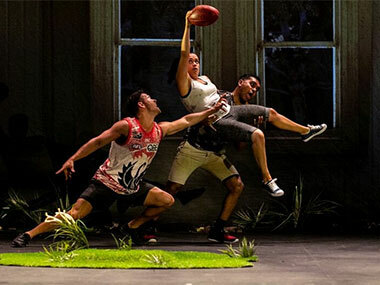 Don't try this at home, but do bear in mind that the show goes on to the Adelaide Festival, where it runs (Dunstan Playhouse, Adelaide Festival Centre) from March 8th to 11th.